As an EHS leader, you know how important training is—but do your employees? Many companies are moving to online training solutions to promote engagement, but OSHA says online training alone will not meet certain requirements. We sit down for a Q&A with David Galt, EHS training expert and speaker at our upcoming Safety Forum event, to talk about these challenges facing EHS trainers and decision makers today. David Galt joined BLR in 2001, and in his role as Senior Legal Editor–EHS Training he coordinates the development and maintenance of all environmental, health, and safety training content for the BLR portals and other training products to help businesses comply with OSHA, EPA, and DOT rules. In his upcoming presentation at Safety Forum, taking place November 12 and 13 in Boston, Massachusetts, he will be sharing tips with safety leaders regarding employee training content and delivery methods that OSHA prohibits, allows, or recommends in its rules and policies, including online or eLearning, classroom, on-the-job training, and even the use of e-mail. Q: What’s the biggest challenge safety trainers face in today’s multimedia landscape? Finding the time to put together and deliver an effective and OSHA-compliant training program is the biggest challenge. It would be easy if all training could be effectively delivered online, but that would not meet the requirements for hands-on practice. An overall effective training program would include a combination of online training, classroom instruction, hands-on practice, and ongoing communication and messaging to learners. Q: Are there any training methods or content that OSHA does NOT recommend? OSHA leaves it to the employer to determine the best method to train workers. However, the agency clearly states that online training alone will not meet most of OSHA’s training requirements. Where a rule specifies that learners must have an opportunity to demonstrate or practice a physical skill, like put on and take off respirators, hands-on skills training must be provided and online training by itself is noncompliant. Q: Do you think online training will ever replace classroom training altogether in the safety field? Online training will never replace classroom training altogether, at least in the foreseeable future where virtual and/or augmented reality technologies are in their infancy. Especially with workplace safety training where learners need to practice and master physical skills, nothing can replace hands-on practice and the benefits of face-to-face interaction and reinforcement of learning from a mentor or one’s peers. Learn More at Safety Forum! 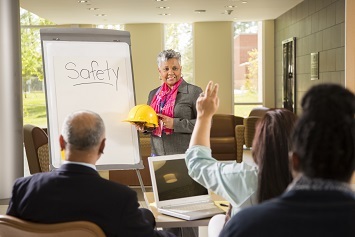 As a safety decision-maker, you know how hard it can be to keep employees engaged in training and ensure that you have the right tools to ensure safety success at your organization. To learn more, join David Galt for his presentation, How to Deliver OSHA-Compliant Training in a Multimedia World, at our upcoming Safety Forum event November 12 and 13 in Boston, Massachusetts! In addition to David’s presentation, EHS managers, directors, and VPs will have the opportunity to meet one on one-on-one with solution providers specific to your current safety project needs—it’s a more efficient way to network with colleagues, source providers, and get custom attention specific to your unique situation. And, better yet—event registration is free for qualified delegate attendees. Learn more and register today!